Imagine your favorite perfume. How would you describe it? You may say that it has a hint of grapefruit and bergamot orange mixed with flowers. Or maybe you would describe it as an intense and spicy patchouli with woody notes and a hint of musk. You'd sound like a perfume pro using this verbiage to describe the fragrances Clinique's Happy and Dolce&Gabbanna's Velvet Patchouli. This verbiage is referred to as the fragrance pyramid. 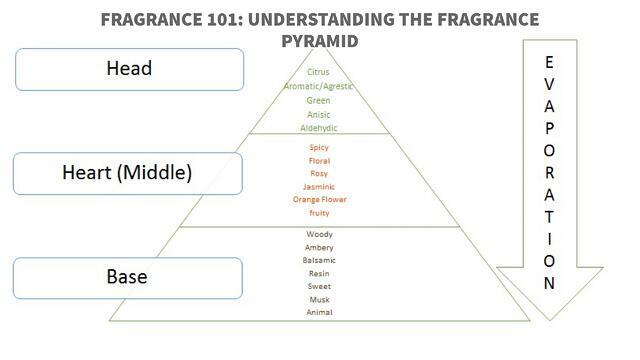 The fragrance pyramid is the composition of a fragrance. The composition is composed of fragrance notes, or ingredients, that create the scent. The three notes are top notes, mid (or heart) notes and base (or dry-down) notes. Now that you have a basic overview of what the fragrance pyramid is, let's get into the details. At the top of the pyramid are top notes. These are the first scents you smell when first exposed to the fragrance. These ingredients are volatile, light and fresh. This note has the shortest life in comparison to the other notes as it can last from five minutes to two hours. When shopping for a perfume, this note will make the first impression and likely be relied upon when making a purchase. Essences in this category are citrus (grapefruit, mandarin and lemon), green (peppermint, basil and spearmint) and ozonic (watery and airy scents). Moving to the middle of the pyramid are the mid, or heart notes. These are the notes that give the fragrance its character and intensity. These notes begin to arrive and fully develop within ten minutes and will remain on the skin for up to three hours. The top and mid notes coexist for a period of time and then the mid notes dominate the fragrance as the scent continues to mature. Essences in this category are floral (rose, jasmine and gardenia), fruity (peach, apple and strawberry) and spice (pepper, clove and cinnamon). Thinking back to the first paragraph, Clinique's Happy would be a fragrance mainly comprised of top and mid notes. Lastly, but quite the opposite of least are the base, or dry-down notes, which are at the bottom of the pyramid. These notes ground and balance the fragrance. Providing depth to the fragrance, this note appears within 30 minutes and will last for hours on the skin and even days on clothing. Essences in this final category are gourmand, or baked and edible scents (vanilla, cocoa and brown sugar), woody (sandalwood, patchouli and cedarwood) and musk (sweet and powdery). Dolce&Gabbana's Velvet Patchouli is a fragrance dominated by base notes. Now that you are well-acquainted with the fragrance pyramid, will this knowledge change the way you shop for fragrances? If you have some time, sample a fragrance by spraying it on your skin and experience how it develops with your body chemistry for several hours prior to purchase. Don't have time to hang out in the mall for hours? Request a sample and try the fragrance on your own time. Let us know what you discover!